Five years ago today I was pregnant with twins. This meant that I had little time before I would become a mom. Four years ago today I had two 11 month olds in my arms and two babies in my tummy. This meant little room to breath. Three years ago today I had four babies in diapers. This meant little room in my smelly garbage can. vying for my attention and trying to cuddle at the same time. This meant little space on the couch cushion. 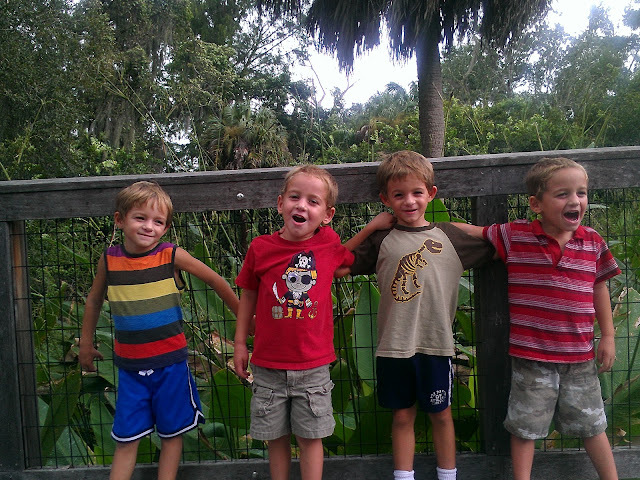 One year ago today I had four little boys whining and bickering every ten minutes or so. This meant little time for peace. Today they don't need me to carry them, they all use the potty, my garbage can doesn't smell, they are often too busy to cuddle, we don't all fit comfortably on the couch, and they are all best friends. gotta say, you are a great mum and a very tough women, tammy.